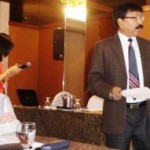 Professor Talat Ahmad while delivering lecture. 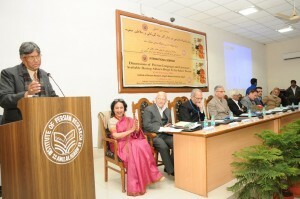 ALIGARH- The Institute of Persian Research, Aligarh Muslim University in collaboration with the Indian Council of Historical Research, New Delhi and National Council for Promotion of Urdu Language, New Delhi today inaugurated the three-day International Seminar on ‘Dimensions of Persian Language and Literature Available during Akbar’s Reign and the Safavi Period’ at the Auditorium of Z H College of Engineering and Technology. While delivering Presidential Remarks, Vice Chancellor, Lt General Zameer Uddin Shah (retd) said that there is a huge contribution of Persian language in the Indian composite culture. He added that since art and literature have no boundaries, Persian culture and language flourished in India and still continues to do so in many ways and many parts of India including the Aligarh Muslim University. Delivering the Keynote address, renowned historian, Professor Harbans Mukhia said that even though Persian language and literature reached its height at the time of Mughal emperor, Akbar’s reign, but Persian influence can be traced even before the Mughal period. He futher said that the Islamic civilization brought a unique concept of history in which the history of the world was seen in the pre-Islamic and post-Islamic periods unlike the Europe’s concept of Ancient, Medieval and Modern periods. Prof Mukhia added that the Islamic historians at the time of Mughals were members of the Mughal court, while European history at that time was written by priests. “This is precisely the reason why, history written by Islamic historians never became a part of theology while history written in Europe became a part of theology,” said Prof Mukhia. Prof Muhkia further said that history accounts written by Muslim historians of the Mughal court also illustrate marvelous discussion on free will versus God’s will. “Mughal court historian, Shaikh Abu-al-Fazal-ibn Mubarak, also known as Abul Fazl, in an interesting experiment went beyond the denominational identities of religion in his writings,” said Prof Mukhia. In the inaugural speech, Former Vice Chancellor of Allahabad University, Prof Naimur Rahman Farooqi said that the tolerant and benevolent policy of Mughal Emperor Akbar and his patronage of learning made possible the conditions in which Persian literature and culture flourished. He added that Abul Fazl’s letters known as Insha-i-Abul Fazl, are regarded as models of epistolary composition and were imitated by scholars throughout the Mughal period. Prof Farooqi said that Persian poetry occupied a special place in medieval age as the most popular vehicle of literary expression with Muslims, both in Mughal dynasty in India and the Safavid dynasty in Iran. “Poetry served the Persians and the Mughals as an easy vehicle to give expression to everything around them,” further said Prof Farooqi. 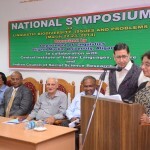 “There were many in Akbar’s days that practiced Poetry in Persian as a regular profession, while others resorted to it as a means of relaxation, or in pursuit of culture,” said Prof Farooqi adding that owing to the patronage extended to poetry, thousands of poets, both Indians and Persians, flocked to Akbar’s court. He also said that even though the Safavid rulers criticized the Sabq-e-Hindi (Poetry from India) because of the excessive use of metaphors but the Safavid rulers like the Mughals made Persian as their court and official language. “It can be seen that Persian slowly replaced the popularity of Turkish and Azerbaijani in the Mughal and Safavid empires,” said Prof Farooqi. Prof Talat Ahmad, Vice Chancellor of Jamia Millia Islamia said that the Persian culture and literature had a lot of encouragements during Mughal Emperor Akbar’s rule. “From becoming an official language of the Mughal Empire to becoming popular with common people, Persian language became instrumental in recording events and translating epics,” said Prof Talat. He pointed out that Abul Fazl translated into Persian many outstanding Sanskrit works, such as, the Kishan Joshi, the Ganga Dhar, the Mahesh, the Mahanand, the Mahabharata, Ramayana, Atharva Veda, Lilawati and Rajatarangini among other works. Prof Kafil Ahmad Qasmi, Dean, Faculty of Arts in his remarks said that both Mughals and Safavids started their rule in India and Iran in the 16th Centuries and both adapted Persian as their official languages. He further said that both Safavids and Mughals made their countries economic powers and great nations. Welcoming the guests at the seminar, Prof Azarmi Dukht Safavi, Director, Seminar said that India at the time of Mughals got great poets from the Safavid Iran as a result of migrations from Iran to India. She added that Emperor Akbar had referred to Safavid ruler Shah Abbas as Bradaran-e-Shah Abbas (brother Shah Abbas) in a letter written to the Safavid ruler, urging him to show mercy to his subjects. 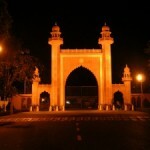 She also pointed out that Akbar had also started a movement led by Abul Fazal to preserve Persian in its original form. While Dr Ali Dehlagi gave his special remarks on the three-day seminar, Dr Mehri Bagheri read out a message from Dr Haddad Adil, Former Speaker, Iranian Parliament to the seminar participants. Prof Mahdi Mahoozi, Head, Department of Persian, Roodhahan University, Iran attended the inaugural of the seminar as a Guest of Honour. Dr Ehteshamuddin conducted the programme and Prof Syed Mohd Asad Ali Khursheed delivered the vote of thanks with a poem written for the dignitaries attending the programme. 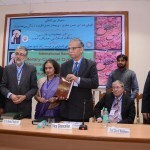 On this occasion, the AMU Vice Chancellor, Lt General Zameer Uddin Shah (retd), released half a dozen of Persian books. Scholars, students, social scientists and Iranologists from Iran, Afganistan, Tajiskistan and various parts of India are attending the three-day seminar.